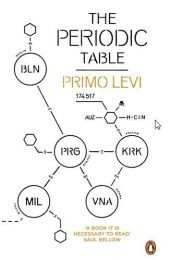 Inspired by the rhythms of the Periodic Table, Primo Levi assesses his life in terms of the chemical elements he associates with his past. From his birth into an Italian Jewish family through his training as a chemist, to the pain and darkness of the Holocaust and its aftermath, Levi reflects on the difficult course of his life in this heartfelt and deeply moving book. 'So it happens, therefore, that every element says something to someone'Inspired by the rhythms of the Periodic Table, Primo Levi assesses his life in terms of the chemical elements he associates with his past. From his birth into an Italian Jewish family through his training as a chemist, to the pain and darkness of the Holocaust and its aftermath, Levi reflects on the difficult course of his life in this heartfelt and deeply moving book.